Juicy Cologne launched their newest Brand Ambassador Kathryn Bernardo on July 25, 2013 at the 9501 Restaurant. Kathryn is one of the hottest stars of her generation and has been constantly trending on social media sites and has a huge fans club who loves and supports her in every project that she’s into. Juicy Cologne on the other hand has many variants that teens and adults would really love. From all the scents of the Juicy Cologne line Kathryn’s favourite was ICYLICIOUS which she said was very balanced, not too strong and not too light, just right for her. She was asked what her love team Daniel Padilla’s reaction on her newest favourite Juicy Cologne is, she answered that he loved it and commented she smelled fresh, hence the giggles from the crowd. Juicy Cologne has 8 scents to choose from, Slightly Sprinkle, Up, Up and Away, Orange Twist, Dreamsicle, Angel’s Bliss, Sweet Delight, Sugar Frosting and Icylicious will all these available nationwide, for sure there’s a Juicy Cologne that’s perfect for you or better yet get them all. Bakit Hindi Ka Crush ng Crush Mo held another Blogger’s Conference, this time with its Director Bb. Joyce Bernal and the online-action-star and writer himself Ramon Bautista. The event was more of like storytelling, very light and fun since the two also was very comedic themselves. Ramon, admittedly didn’t know that he will be included in the movie “Akala ko talaga dadaanan lang ako ng camera yung mga ganun lang” but he was happy that he played a big part in this film. Ramon was also excited for his book that now has a new cover featuring Kim Chiu and Xian Lim and jokingly tells everyone to not have their book borrowed by anyone so others will buy their own copy, he also made a quick mention of his next book titled “Help!, Ayoko na sa syota ko!” This will surely be another book hit for the writer. Direct Joyce said she was excited the first time they had the meeting for this project, knowing that this will be the first for Kim and Xian, she wanted a different attack, she thought of it very well since she doesn’t want it to look like the regular love team- romantic comedy movies. She also mentioned that she finds Ramon fun and funny which contributed to her sanity during their shooting days. 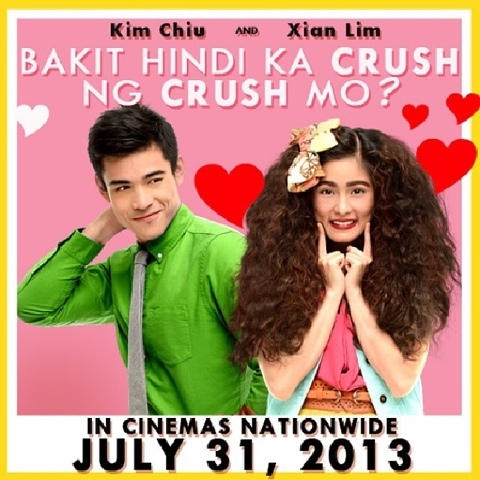 Bakit Hindi Ka Crush ng Crush Mo stars Kim Chiu and Xian Lim and will be shown in cinemas nationwide on July 31, 2013. Have fun and feel the good vibes and you might finally get the answer. After four and a half years of being together, the high-profile couple decided to end their relationship quietly. Once touted as one of showbiz’s long enduring relationships, Billy and Nikki shocked loved ones as they broke the news to them. Billy tried to save the relationship, but Nikki found it best to sever it off for their own good. In the end, it was a mutual decision. Earlier in the relationship, Billy and Nikki thought, and everyone believed that they would end up together. They were in fact seriously talking about buying a house of their own and some investments, too. But things happen for a reason, and years after, the separation was the best option for the both of them. They confirmed though that there was no third party involved in the break-up. When asked to elaborate why, Billy admitted that perhaps, they kind of grew tired with each other and before they knew it, they felt they were already and slowly growing apart. Nonetheless, both of them are thankful for the 4 ½ years of beautiful memories. This show was one heck of a ride, following how they do their tasks and the much awaited boardroom meetings. I actually love the show and admire all the contestants, I wish to have their abilities and knowledge in what they do best. I would really love to be like them, giving their thoughts, raising their concerns and mainly doing those battles on what they believe in. Truly, this show inspired me to do better in the industry I work in. Knowing that this week will be the best of two I am super happy that we have Jon from the Philippines still on the spot to possibly be chosen as Mr. Fernandez's Apprentice, but let's not forget Andrea, she's a tough lady too, I actually admire her, being at a young age but successful in her chosen field. I can't wait for Wednesday, but I still don't want this show to end, but whatever the outcome might be it is indeed a milestone for Jon to represent our country and be "the man". Samsung recently released yet another mobile phone innovation through the Samsung Galaxy Mega. Samsung Galaxy Mega were launched via two models, the 5.8 which is a dual sim phone and the 6.3. Both phones are equipped with the latest apps and software needed by most people on the go and can adapt to the fast phase of technology and lifestyle changes. These new gadgets were made available in the market via the unveiling of the newest Samsung Experience Store at SM Aura Premier. Come and visit, these new phones are now available in the market at Php 18,999 for the Galaxy Mega 5.8 and Php 23,999 for the Galaxy Mega 6.3. The news is now in, Catherine, Duchess of Cambridge, or whom we have known as Kate Middleton has given birth to a baby boy and is now known to be The Royal Baby. Congratulations to the Royal Family and we will be on standby to witness when and where the Royal Baby will be first seen and introduced. Next up for the 20th Anniversary of Star Cinema is a film starring Kim Chiu and Xian Lim, this is their first official movie as a love team so for sure KimXi fans are excited. What's more is that this is based on the book of the well known online-action-star Ramon Bautista's "Bakit Hindi Ka Crush Ng Crush Mo" which had made people laugh.